Significant figures are the digits that contribute to precision and accuracy. 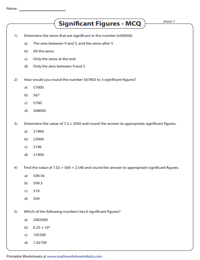 Encapsulated in these significant figures worksheets are exercises like identifying the number of significant figures involving whole numbers and decimals, accompanied by an adequate significant figure multiple responses and MCQ worksheets. Learn to determine the number of significant digits using the significant figure rules and round them as well. 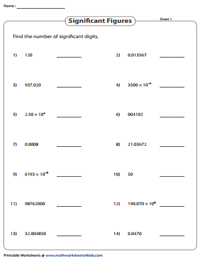 Employ this array of worksheets to learn about significant figures. Observe each number, apply the rules and determine the number of significant digits in the number. 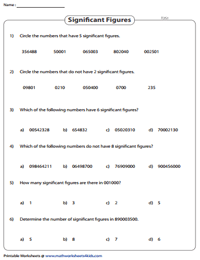 The exercises in type 2 worksheets are featured in the form of multiple responses and MCQs. 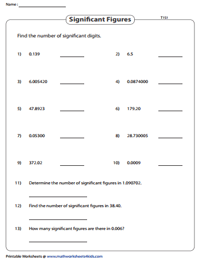 In this set of worksheets, circle the numbers that contain specific significant figures. Also, identify how many significant digits are there in the given number. Keenly observe the decimals and indicate the number of significant figures for each of the given decimal number. Trailing zeros and zeros after the decimal point plays a vital role while determining the number of significant figures. Utilize these resources provided in the form of multiple choices and multiple responses to review the concept of significant figures involving decimal values. This section contains large numbers expressed in scientific notation form. Exponents play no role in finding significant figures. Ignore the exponents and apply the same set of rules to find the significant figures. 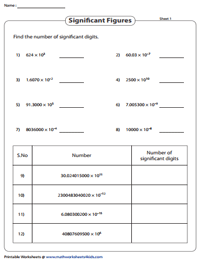 Get a complete recap of significant figures with this collection of revision worksheets. 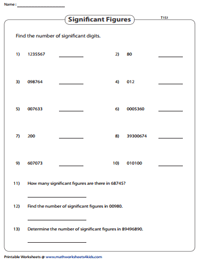 Record your answers to the correct number of significant digits and validate your answers with the answer key provided. 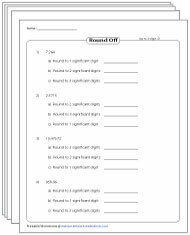 Navigate through this wide array of worksheets that contain problems on rounding decimals to the specified significant figures, rounding the sum, difference, product and quotient, simplifying numerical expressions and a lot more. 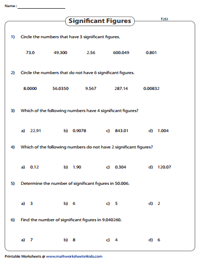 Practice significant figures with this set of exercises given in multiple-choice format. It includes all types of questions like identifying significant zeros, rounding the numbers to the specified significant digits, how many significant figures contained in the product and the sum and more.